kathan Brown founded Crown Point Press as an etching workshop in 1962. Located in San Francisco, it has grown to be one of the world's most influential art print publishers. Crown Point Press received the Cyril Award for Arts Business Excellence from the Chamber of Commerce of the City of San Francisco in 1997. The press has been the subject of exhibitions at the National Gallery, Washington, DC; the Fine Arts Museums of San Francisco; and the Museum of Modern Art, New York. Artforum's Bookforum has called Kathan Brown's writing "the next best thing to being there." She is the author of eight books, including Ink, Paper, Metal, Wood (Chronicle Books, 1996) and the editor of the popular MAGIC SECRETS instructional series for printmakers, published by Crown Point Press. She has contributed articles to A John Cage Reader (Wesleyan University Press, 1983), the Cambridge Companion to John Cage (2002), and The Guardian newspaper (UK, 2002). She has lectured widely and holds honorary doctorates from the San Francisco Art Institute and the California College of the Arts. In 2011, she received a 30th Anniversary Honors Award from Art Table, New York City. The Honors Awards recognized thirty women "whose work has transformed the visual arts landscape" in the United States. 4.0 out of 5 starswell written with great photos. sustain her outlook on life in general. I really do appreciate her candidness. 5.0 out of 5 starsSatisfying read. Very heartfelt and inspiring memoir about the life of an individual and her business. The amazing collection of artists she worked closely with and her personal accounts of their processes and personalities is fascinating. Very personal book with great insight into the world of printmaking at its best! Hands down, the best art book I've read in years. It's a memoir as well as the story of an unlikely business. Kathan Brown's life intersects with fascinating artists such as John Cage, Ed Ruscha, Wayne Thiebauld, and Richard Diebenkorn, and Julie Mehretu as she invites each one to create an etching in her newly formed Crown Point Press- (with the help of highly trained printers). Several artists come back each year - we follow John Cage, for instance, through the decades. 5.0 out of 5 starsKnow That You Are Lucky is a great read! 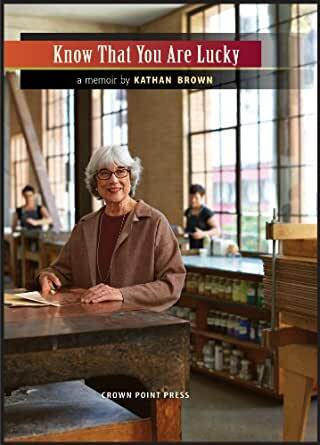 I really enjoyed this book by Kathan Brown about her memoirs of her life and work centered around her business, Crown Point Press. It was interesting on many levels, from the stories about both the artists and skilled printers who collaborated to produce fine works of art, to the ebb and flow of a business over the years to the story of Kathan Brown's personal passion and resilience. You don't need to be familiar with the printing process to find it fascinating. 5.0 out of 5 starsIncrease your creativity! Kathan Brown's memoir, Know That You Are Lucky, is striking at many levels. As a printmaker who helped revive the rare craft tradition of fine print etching in 1962 and who has successfully run a small business for fifty years, Brown reveals her persistence, intelligence and, above all, wisdom. She was born in the mid-30s in the heart of the Depression and grew up during World War II and the 50s. She gracefully unspools her life as a granddaughter, a daughter, a wife, a mother, and a grandmother; these aspects of her multiple selves intertwine effortlessly with her pursuit of her work as a creative leader in her field. As a feminist, a scholar, and a writer who came of age in the 1960s and 1970s, I marvel at Kathan Brown's ability to surmount the difficulties and challenges that life throws at her and her forebears. This book was an utter delight to read, a real page-turner. Her honesty and generosity in these struggles suggest that they are our very own. She gives us wisdom in tender aphorisms: Hold on Lightly; Go as Far as You Can See; Keep Searching for What You Need to Know; Leap to Conclusions that Logic Cannot Reach, and many more. These apply both to the printmaking world, the artists she has worked with, and to our own creative lives. I have a feeling that this is a book I am going to return to again and again. Setting her stories in a rich political context makes for engaging reflections and reveals the relationships between her own developing artistry, and intuitions in the midst of flowing history. What I find so helpful is her rich understanding of processes of creativity, as she has worked closely with some of the greatest artists of our time: John Gage, Wayne Theibaud, Sol Le Witt, Richard Diebenkorn, Francesco Clemente, Robert Kushner, Anne Appleby, Mary Heilmann, among many others. This book shares the history of a successful small business run by a woman for over fifty years. Most of all, I loved the multiple ways in which she shares how actual artists worked in her studio;: their methods of being, their exploration of their own search for understanding and discovering the world are stunning. What I found most moving is to I think of this adventurous young woman, having the courage to follow her vision for herself, and who in the process created a place of being and becoming for so many artists. She and her hard working team at Crown Point Press helped so many artists rediscover a hand press tradition that had gone out of favor fifty years ago and yet now hasd shaped the lives of some of the greatest artists of our time. We, in the middle of our busy lives, often do not have time, energy or wherewithal to sit at the feet of an elder wise woman who is activated, energetic, and intelligent. This is a book I feel I am going to return to again and again. Kathan Brown's bravery and courage, her calm intelligence, her sheer love and focus of her work, her generosity of heart and mind, her high level of competence in finance and managing others, all of this casts a spell that is worth being entranced by. It is a spell of magic that teaches us the secrets that have worked for her and could work for many women and men who want to do something special in the world, who live at the edge of their capacities, and who desire to succeed in their own special way as well as the ways in which the world counts as success! I urge you to buy this book for yourself and your many artist friends with art as a large canvas for expressing our humanity!